At first glance this appears to be an 18th Century British naval officer's 5 ball spadroon, with the distinctive "cigar band" around the grip differentiating it from an army officer's version. 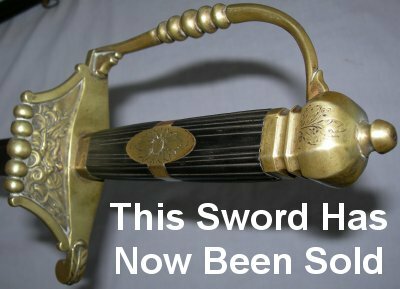 However, the guard work on this sword is more elaborate than normal and therefore may well be an 18th Century French Dragoon Guard officer's 5 ball spadroon, which is no bad thing as the later is very rare and should command a higher price. Certain elite French Dragoon Guards officers did adopt the British style five ball spadroon for their own before the French Revolution. The blade is 83.3 cm long and firm in the hilt; it has most etching and some blue and gilt remaining, although is also has a lot of black patina. There is no discernable looseness anywhere and the grip is in good order. Further pictures available upon request.